Here, the sky is the limit! 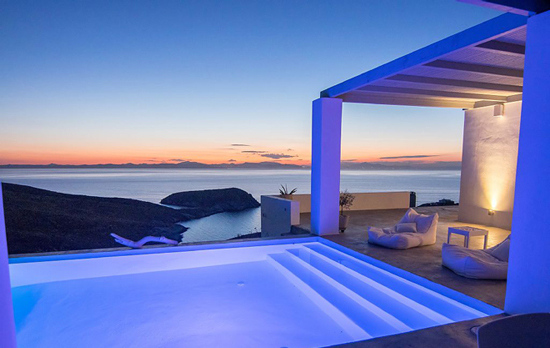 These two luxurious and cleverly designed exclusive residencies, each one with its own style in an inspired balance between contemporary and traditional Cycladic architecture, offer you the ultimate relaxation and privacy combined with luxury and comfort. Both villas, in 200 m distance from each other, are created for a convivial holiday escape, are set in their own private area of 1400 m2 of authentic Cycladic beauty, in a remarkable setting with bird’s eye sea views, in 150 m from the sea, and in a prime location of warm colors of the earth to the shifting blues of the Mediterranean Sea. Dreamy king sized beds with direct views to the sea, floor to ceiling glass doors, comfortable and beautifully decorated communal areas, bright white walls that reflect the strong Cycladic sun and help the houses remain cool, spacious fully furnished terraces with Pergolas and elegant dining furniture, relaxing long chairs, cute coffee tables, comfy sun loungers and shadowed pergolas, make it hard to leave the villas. Located in the western side of Kea island, the hidden gem, the luxury ‘suburb’ of Athens, these unique villas enjoy a private, peaceful and authentic Cycladic audience while at the same time they are in very close proximity to the yachting marina of Vourkari and its lively cafes, restaurants and bars, minutes away from the sandy beach of Otzias and from the port. 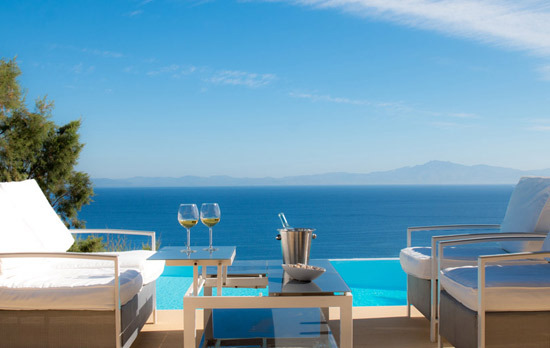 Soak up the scenic panoramic views to the deep Cycladic blue from every part of the villas, while you enjoy your private service under the shadowed pergolas or on the sunny deck on the terraces. Dip into the infinity - multicolored pools, share precious moments with your loved ones, play and laugh. We will warmly welcome you at the port, accompany you to the villas in 10 min drive, refresh you with a cold drink and a basket of fruits and assist you to anything you may need. Welcome to our family summer retreat. Here, the sky is the limit! Villa Meli,a luxury modern comfortable brand new villa with private pool, open air kitchenette - bar, on a small cliff, 200m distance from the sea with astonishing views to the Aegean, beautiful sunset, outdoor shower, fully equipped kitchen, A quality linen, 15 min walking to a private small beach or 2 min drive to the sandy organized beach of Otzias perfect for kids.